My family is . . . complicated. My food restrictions, for those who aren’t used to dealing with them, are complicated. My emotions around Thanksgiving are complicated, too. Thanksgiving isn’t always the best time of the year for me. Okay, honestly, it’s often one of the worst days, emotionally, and has been for a long time. This year, I decided by about February that my husband and I would celebrate differently this Thanksgiving, to see if we could remake it into something I can enjoy. Then, as the months passed, I wondered if I really had the guts to walk away from the family traditions for a year to reconfigure Thanksgiving for myself. Focusing on self-care will do some interesting things for you, though. I found a way to tell my mother and other family members that even though I would miss them (and I did), Dan and I would be alone this Thanksgiving. And we stuck to it. We slept late, made fabulous chocolate-hazelnut waffles with raspberry sauce for brunch, hiked and took photos at a gorgeous state park (a new tradition), made my favorite tuna salad with homemade ‘cream’ of tomato soup for dinner, and walked down to the closest theater to see a movie. As it grew dark around us, I stopped walking and turned to Dan with happy tears in my eyes. I had realized that Thanksgiving had passed by with no drama or tears. A lovely day—peaceful and rejuvenating—that filled my heart with gratitude. It was just what I had wanted for the day to be. I have to share the waffle recipe we created for our brunch. It is an over-the-top, indulgent kind of celebratory breakfast. We served ourselves two waffles each but could only eat one. . . . Waffle-making is an art in general, but when you remove gluten, eggs, and dairy from the ingredient options, it’s a much more complicated art. Fortunately, these turned out just beautiful—crisp outside, with soft insides that weren’t gooey (a common issue with gluten-free, egg-free waffles). They were heavenly. 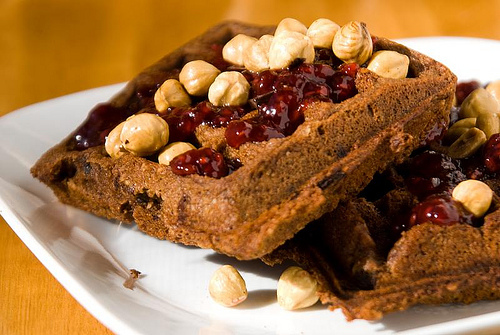 The raspberry sauce and toasted hazelnuts we put on top of the waffles were just right, too. Those who’ve tasted the chocolate/hazelnut combination of Nutella know its lure—rich, smooth, luscious. But Nutella and other chocolate-hazelnut spreads typically contain dairy. This waffle recipe combines the flavors without the casein—or gluten or eggs. In a small cup or ramekin, mix the flax meal with water, and allow to sit so that it gels. In a large bowl, combine the hazelnut meal, flours, cocoa, baking powder, baking soda, and salt. Stir. Break up any lumps. Combine the flax gel (or eggs and flax) with the sugar and vanilla extract. Whisk together well. Pour in the milk and melted oil. Stir until combined. Fold in the chocolate chips. Pour the wet ingredients into the dry ingredient bowl. Stir well to combine. Allow the mixture to rest for 15 minutes before pouring the waffles into the well-greased waffle iron. Bake according to your waffle iron’s instructions. Have you participated in the drawing on my Art Sale & Giveaway post? If not, be sure to look at that next! Sounds wonderful and tasty. I’ll have to try that. Just wanted to say I’m very glad you had a peaceful and happy Thanksgiving. We also had a quiet (relatively speaking with a toddler–hehe) thanksgiving at home. There were things we needed to do here and we wanted to go lowkey. I’m glad we did–we’re having a wonderful (rare) four day weekend here. I wish amercians got more time off work like everyone else aroundthe world! I’m so glad for you, Sally! I know that Thanksgiving is a huge deal in your country, and I think it took great courage to stick to your plan–which sounded fabulous, by the way! Now THAT’S the kind of holiday I’d like to enjoy, too. And I must try the waffles! that sounds amazing! congrats for the courage to go out on your own and do things your own way. I can imagine that it would be stressful to be surrounded by all of those traditional dishes from your past and you would only be limited to one or two of your own specially prepared choices. Although I don’t have food allergies, I think that would be a restrictive feeling. I’m glad that you and Dan got to put your own spin on it. Oh man… I could have written the sentences about family and Thanksgiving too. We, too, had a much-needed quiet (just the two of us) Thanksgiving…. and I’m quite convinced that not everyone in my family understands nor cares to. Regardless, our day together was lovely. I am happy to see that your day was as well. After all, Thankfulness for daily living comes in many more forms than people crammed around a table overeating. Sounds wonderful! I’m so pleased that you found a way to reclaim the holiday for yourself after years of dreading it. Welcome to the world of the anti-holiday holiday!!!! 🙂 I have been un-celebrating holidays for about 4 years now, and I have to tell you…. I think I’m one of the few people who actually comes back rested after the holidays. There’s so much build-up and hype around the holidays and so many expectations. People tend to fall into their usual roles within the “family dynamic”, and it can be impossible to relate to some people once they are in that dynamic. I think that a huge part of truly becoming an integrated adult is examining traditions and deciding which ones to keep (and why) and which ones are not positive. Oh. my. those look SOOOOOO good! What a great use for nutella! These are definitely on the “to make” list!! Here in the UK, in the GF aisle of the grocery stores, we have a dairy-free version of Nutella. If you know anyone who visits here, have them bring you home a few jars! You could also Google it and see if there’s a US version that you could mail order?? Sometimes I’m surprised when I find something so unexpected. I have lots of recipes that should fit your dietary requirements — hope my blog is helpful. I love yours! These sound delicious! Thank you for sharing!!! I’m so happy that you were able to enjoy Thanksgiving. I’m glad you did it how you and Dan wanted to do it, not how your family dictated. I’m glad that because of that, you were able to focus on what you were truly thankful for and not on the drama. I’m sure your family missed you, but if they were honest with themselves, would also be happy because you were happy. I made your waffles this weekend. They are really wonderful. I haven’t quite figured out my new waffle maker, so none them came out whole — ah well. I served them with a merlot and berry reduction. So wonderful. If had to do it over again, I would have served us each half of one and put the others freezer. They are so rich and wonderful. Might also make a fabulous dessert. Our gluten-free, dairy-free, egg-free friend also can’t have chocolate. I’m assuming leaving out the chocolate chips isn’t an issue, but what about the cocoa? Do you have to add more of something floury to replace the missing cocoa? Thanks! Julie–Of course, I can’t guarantee what will work, but if I were you, I would try replacing the cocoa with three tablespoons of a very fine flour, such as sweet rice flour. If you make successful alterations, please report back! Ok, so I made the “waffles” yesterday. I use quotation marks because they ended up being pancakes instead – issues with sticking to the waffle iron on both sides and coming apart in the middle, requiring the waffle to be scraped off the waffle iron in little tasty but not servable bits. Grrrr. Anyway: taste was really good. They were a bit crumbly, so had to be handled with care, and anything bigger than a dollar-sized pancake couldn’t be flipped successfully. Also, we had to use a non-stick frying pan because they stuck in the other one. I replaced the cocoa with carob powder and just omitted the chocolate chips. Sweet rice flour was only available at our health food store in a good-sized bag, and I only needed it for one recipe (cooking for an allergen-free guest this weekend), so I bought a bit of short-grain rice and put it through the blender until it was a fine powder (took a while). Maybe it’s not exactly the same as sweet rice flour, but it seemed to work. Thanks for the recipe!